As many of my runner friends are gearing up for this weekends Disney's Wine and Dine Half Marathon, I will be spending time with my yet to be born niece, Madison. I cannot wait to meet that little girl. I thought about this weekends race while at Epcot Food and Wine Festival on Sunday. The festival kicked off the night prior to the Tower of Terror 10 miler and due to this, I didn't get to truly enjoy the experience at Epcot. Hungover Megan's do not need to be running 10 miles at night! We went again this weekend, knowing it was our last chance before the festival ended. Sadly, we didn't make it halfway around the world before giving up. This got me thinking. Would I rather an all inclusive day at Food and Wine Festival or a Free entry to Wine and Dine Half Marathon? The foodie in me wins. Plus I still think I would be sad knowing all of my friends were enjoying the festival while I was running 13.1. Below I present my halfway tour of the 2012 Epcot food and wine festival. America, Hops & Barley: I swore off going to the America marketplace until I saw Linda Bean's Perfect Lobster Roll's on the menu. I couldn't get there fast enough. Lobster Rolls are my #1 weakness in life. Some go for chocolate, some go for chips, I go for Lobster Rolls. They were so good. For the amount of Lobster, it wasn't a bad deal at $7.50, considering I have paid 3 times that for a full sized lobster roll which contained a little more meat. I would have been happy sitting in America eating these all day long. South Korea: Lettuce Wrap with Roast Pork and Kimchi Slaw. I loved the Kimchi Slaw, the pork was good. For $3.25, I was very impressed. Kimchi is my new BFF. Chicken Satay with Spiced Peanut Sauce and Pickled Vegetables, $3.75. I loved this, pickled veggies and spiced peanut sauce, one can never go wrong. In china, we also had the two specialty drinks, the Happy Lychee with Vodka and the Sunny Guava with Coconut Rum. Both drinks were pretty good and had a nice pour to them. 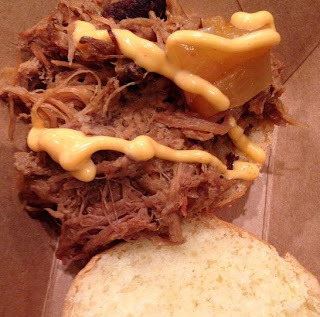 Kalua Pork Slider with Sweet and Sour Dole Pineapple Chutney. It was pretty good. I think I make too much pulled pork at home to appreciate this. I loved the pineapple chutney though! I also tried the Seven Tiki Mai Tai and the Heitz Wine Cellars Chardonnay while in Hawaii. I wasn't personally a fan of the Mai Tai. The Chardonnay was good but at such a small pour, I realized I wouldn't be happy receiving a wine this tiny. That was my one and only wine at the festival. Grilled Beef Skewer with Chimichurri Sauce and Boniato Puree. That Boniato (tropical sweet potato) puree was AMAZING. I still don't understand why we ordered this for $5 though. BUT if you do not live in Tampa, order this! It was very good. The Beef Empanada for $4 which burned my mouth. A little mistake on our behalf as they are down the street for $1.50. It's a good sharable dish though, so once again - if you do not have access to this food, get it. All in all, I was very impressed with this festival. You have to plan it out accordingly though to get the most out of your day, belly and wallet. You can check out all of the 29 marketplaces at Epcot Food and Wine Festival here. Until next year Food and Wine Festival....although my friends at Mexico will keep me company in the meantime with their ferocious margarita's! Looks like you guys had a tasty time! 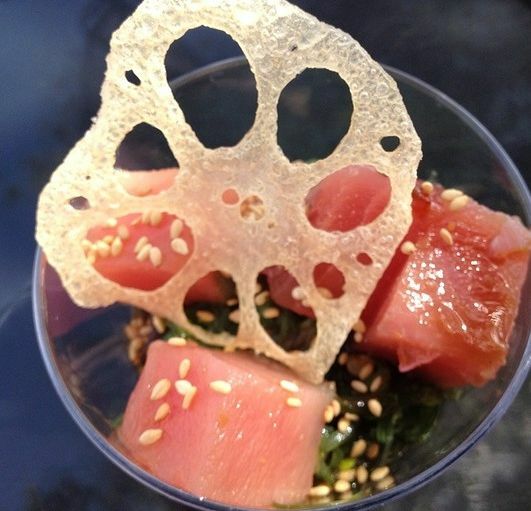 I have never been to Food & Wine fest, but it sounds fun! It's so much fun Katie! You really have to get your passes to enjoy it all since it takes more than one day to get the whole experience. You won't believe this, but I've never been to epcot... This festival sounds right up my alley! I LOVE EPCOT! Hated it as a kid....now as an adult, they offer so much. Eating and drinking your way through the lands is one of my favorite things to do. They have so many festivals too. My H and I have gone to the Food and Wine Fest for the last two years and will continue with the tradition as long we live in Florida. I love Disney and food so it's a win-win for me! This year we will enjoy it after I run my first half marathon! I'm excited but will also miss enjoying the fest during the day during one of the nicest times of year in Florida. My favorites are the Beef Skewers at Argentina and the Canadian Cheddar Cheese soup....will definitely motivate me during my run! OMG - that lobster roll made me fall out of my chair - YUM.